Shake up your fitness routine! Here are fresh ideas to try this fall. Remember the excitement of starting a new grade in school? Or the relief you feel when the heat of the summer fades and the days start to cool off a bit? Fall is traditionally a time for getting “back on track” after a more laid-back summer schedule. Here are some ideas to kick off your fall fun. Try tai chi. Tai chi is a smooth, flowing variation of martial arts that helps improve overall fitness while lowering stress. This low-impact exercise can be modified to fit your needs. Look for a class at a local fitness center or a DVD at the library. Take a spin. You never forget how to ride a bike. So why not hit the local bike trails? 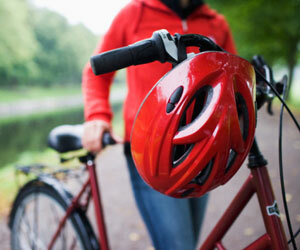 Many bike stores rent both bikes and helmets at reasonable prices. Get that feeling of freedom you had as a kid while riding a trail that lets you take in the beautiful fall colors! Get in the school spirit. You can rack up some good mileage while learning about history, art, or architecture at a local museum. Both your mind and body will be happy you did. Go geo-caching. If you like your walking to have a purpose, you might also like geo-caching—in which you look for hidden treasures while exploring parks and even urban areas. Using a GPS or a phone with map capabilities, you’ll follow coordinates to a location to find what’s called a cache. Along with the thrill of the hunt, geo-caching is a great way to immerse yourself in fall foliage. You can learn more at geocaching.com. Discover disc golf. What happens when you combine a flying disc and a few targets? Disc golf! Similar to regular golf, disc golf involves walking a course that has baskets instead of holes. The goal: to get the disc in the basket in the fewest shots. Many parks have disc golf courses. If there’s no course near, head to a park or your backyard and pick targets, like a picnic table or tree, and toss away. Follow a fitness dream. Consider an activity you’ve always wanted to try—tennis, golf, hiking, canoeing, kayaking…. Find a group or rental place in your area (start at a sports equipment store, in the phone book, or on the web), and get moving. Fitness opportunities are all around you…just take a look!